Social media has exploded and it shows no signs of slowing down. In fact, if you don't utilize your company's social media accounts to grow your business, you're behind the game. Social media has become an integral part of marketing strategies and needs to be treated as such. Many businesses know this but they just don't have the skills, knowledge, or time to properly manage their social accounts. Enter the social media manager. 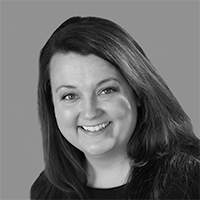 A social media manager develops, implements, oversees, and manages marketing strategies for a brand's social media sites. If this sounds a lot like marketing, you're right. It is marketing. For some businesses, particularly small businesses that don't have a marketing budget, social media has emerged as their primary marketing avenue. It is a cost-effective, highly controllable, and timely way to market a business or brand. When done well, social media marketing can be a very effective way to learn about your consumer base, your partners, your competitors, and your industry in general. It also puts the power of telling a brand's story squarely in the hands of the brand: your voice, your story, on your terms. Successful social media marketing campaigns give the avenue the same weight as their other marketing efforts. For many businesses that means hiring a dedicated social media manager. Finding social media managers isn't difficult, but finding effective social media managers is a different story. You want to find someone who understands your brand, engages with your audience, understands the tech behind social media and the people who use it, is a good communicator, and understands and values the role of marketing. As you build your online presence, finding the right social media manager becomes crucial. 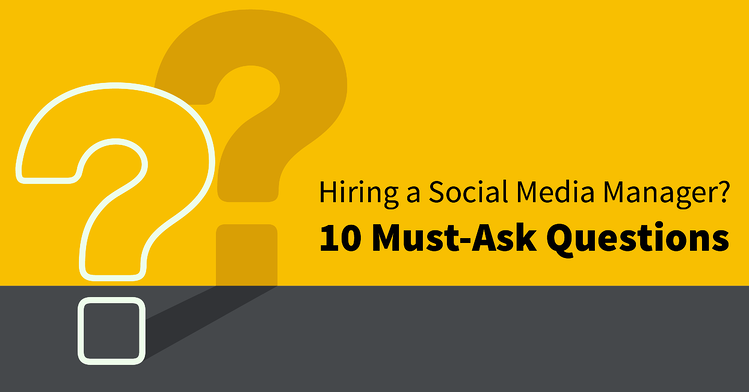 To aid you in your search, we've developed this list of 10 questions to ask candidates as you look to hire a social media manager. One of the first decisions you'll have to make is whether to hire a social media manager as an employee or to outsource the function via freelancers or contractors. The decision should factor in the size of your organization and the number of social media accounts you have (or want to have), your marketing and personnel budgets, and the amount of time you want to devote to social media. The benefits of having someone on staff to manage your social media presence are that they have in-depth knowledge of your company, brand, and products and easy access to business decision makers. The downside is that they often have less experience or more narrow experience than contracted social media managers. Outsourced resources can be extremely helpful because they offer many services under one roof, but you need to make sure they get your brand and target market right and have a process that will work for you. What is your process for creation and approval? Find out how they like to work. What is their approach to social media management? How will they work with you to ensure the quality and tone of messages? Can they think critically about the process and adjust strategies as needed? Where do you source your images? If you plan to use images on your social sites (and you should!) discuss where the images come from. A well-rounded approach will use a mix of company-owned images, custom images, and appropriately licensed images. You don't need to hire a social media manager who is a graphic artist, but they should have a good eye for design and know how and where to source and edit images. Are you familiar with rules around social media? Yes, there are rules that need to be followed or you risk opening yourself up to a lawsuit. For example, some events cannot be mentioned by name in social posts. Will you monitor mentions of the brand? How will comments and incoming messages to our accounts be handled? Full service social media management should include monitoring comments and then working with you to craft prompt responses. At a minimum, they should forward mentions and comments to the appropriate staff member for review and response. Do you understand the importance of social advertising and do you have a track record of delivering results for your clients? Anyone can say they are a social media manager. What matters are the results they have achieved with their efforts. Ask for concrete examples of successful campaigns. Do they have experience with paid social ads or are they willing to learn? What do you focus on: the number of likes a post receives or results that will actually impact our bottom line? The right answer to this depends on your own goals for the social media campaign, but most businesses prefer actions that result in more business. Check out our post on why leads are better than likes. How do you work with others? A Social Media Manager will need to coordinate with your web developer, marketing staff, and other key people in your organization to get the best results. You need a team player. What do you know about SEO and content marketing? As a person involved heavily in your online presence, the candidate should have an understanding of SEO and content marketing. At a minimum he or she should understand how blogs and social media content fit into search rankings, and how content supports marketing efforts. What is your marketing experience? As part of your marketing campaign, it helps to find a social media manager who has marketing experience. Find someone who knows how to build an audience, promote a brand and work as part of a team to acquire and retain customers. What is your experience with customer service? Social accounts are very close to your customers. You want candidates who understand this and are accomplished in both social marketing and customer service. Social customer service requires patience, empathy, an ability to handle conflict, and knowing when to hand the situation off to higher management. Remember, their reactions and responses to social commentary aren't going to just that one customer, they are going to your entire social audience. Finally, think about how you mesh with the candidate. You will need to rely on them, trust them, and work with them often to create an effective social media campaign. Just as with any new hire, you want someone who fits in with the company culture and understands your brand.